Get far away from the crowded pistes! We run holidays aimed at the complete beginner to the sport and spend the initial day on the piste at the Sierra Nevada ski centre becoming acquainted with the skis, skins and boots. 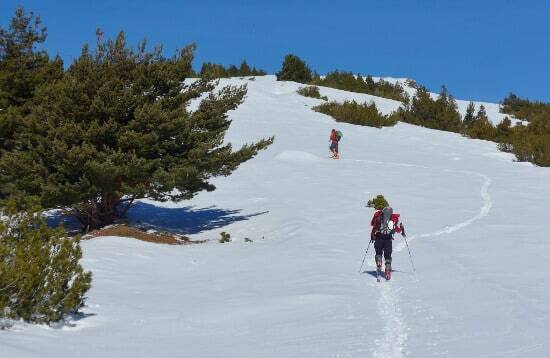 Then it's off on our first foray off piste, when a simple day tour up and down Veleta (3,398m) will be made. From then on we either do day or multi-day trips from access points to the north and south of the range. We will stay in the high Poqueira Hut, which will allow us many great days skiing, including an ascent of Mulhacen (3,482m), the highest point in mainland Spain. The intention will be to progressively increase the standard of each day's tour. The course is suitable for those with some previous on piste experience who are also strong mountain walkers. We can provide skies, skins and poles as part of the holiday cost. 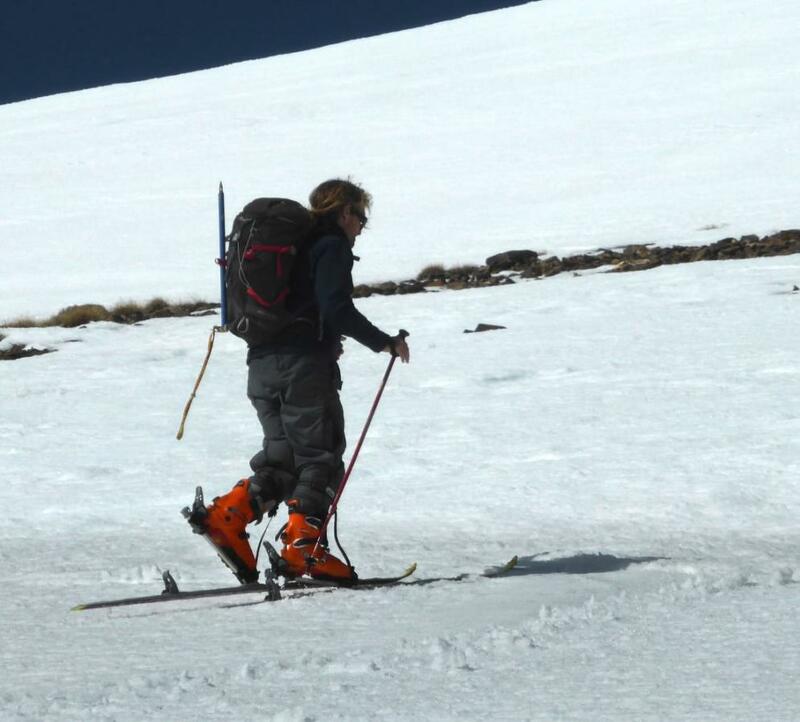 We also run trips for those who have tried ski mountaineering before but who wish to expand their skills and experience. We really enjoyed the week. It was pretty tough but very worthwhile. We were both keen to try ski mountaineering and you provided us with a great introduction. 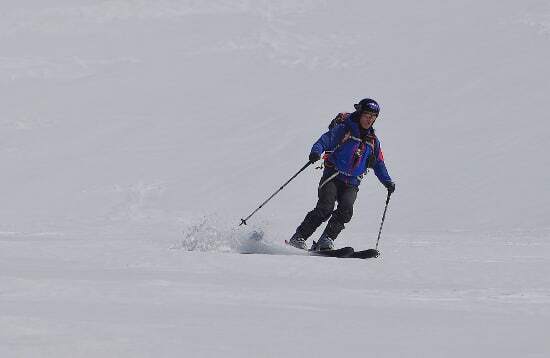 Looking for DOWNHILL on piste skiing? Cerro de Caballo (3009m) from Fuente Fria above Niguelas. Las Alegas and Tajos de los Machos (3085m) from La Piuca. The Cartujo (3152m) from Pradollano. Cerrillo Redondo (3055m) from Puente Palo. Mulhacen (3481m) via the Refugio Poqueira. Loma Pelada via the Refugio Poqueira. Chullo (2608m) from Puerto de la Ragua. Morron Sanjuanero (2610m) from Puerto de la Ragua. 5 Day High Level Ski Challenge! 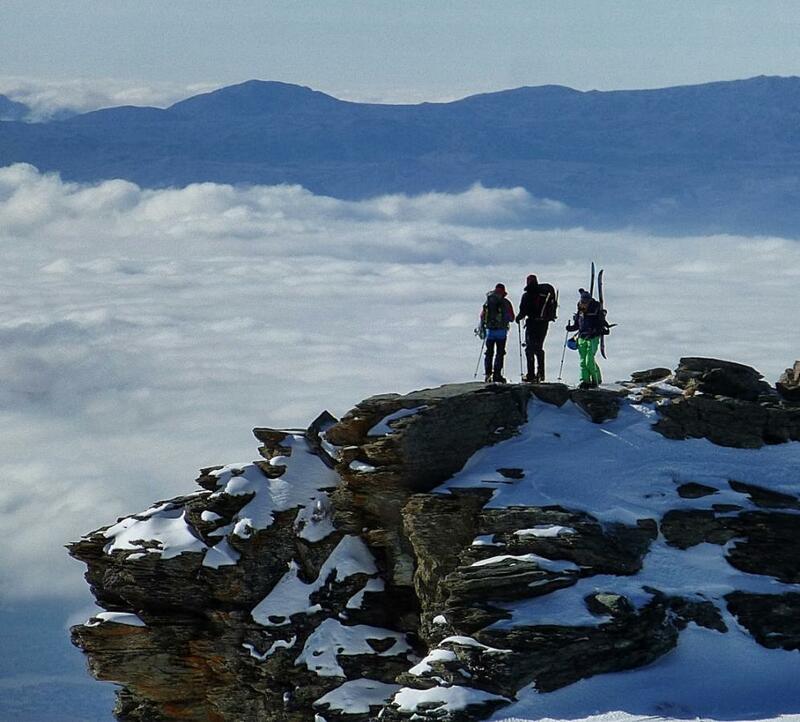 A 5 day ski tour traversing the Sierra Nevada mountain range and 3000m peaks in southern Spain. A magnificent ski tour for those wishing for something a little different! If you are into high mountains, long tough ascents, incredible swooping descents down deserted slopes and virgin snows, then this may just be for you. Covers the major peaks of the Sierra Nevada range staying in guarded and unguarded refuges. Starts just 100m south of the summit cairns. Can be very icy until mid height on the descent as high winds tend to scour the top half of surface snow. At times, when the ice is continuous or transparent, then leave well alone. There have been accidents here in similar circumstances. When the whole face is complete with fresh powder it gives a fantastic run down to the Caldera. 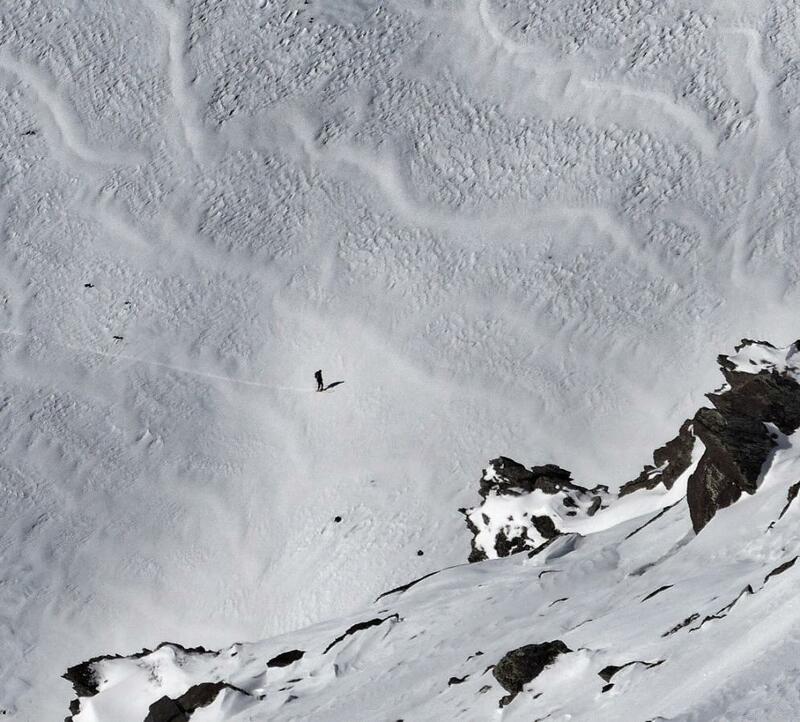 Make sure you keep well to the right of the avalanche area marked on our map. It is tempting to cut the corner. The advice is dont. A difficult but enjoyable run in the right conditions. Start anywhere south of the summit and before the start of the east ridge. Head down continuously steep slopes. We only do this in perfect snow conditions (there can be an avalanche risk on some sloping slabs lower down on the left), so it is usually a rapid trip down to Siete Lagunas. One always gets the feeling it is over too quick at times! From there the options are down to Trevelez or re-apply the skins and contour round the east flank of Mulhacen at around the 3000m level, linking up to the south ridge. Easy angled for the most part. No avalanche dangers and normally good snow as is on leeward side of the normal prevailing weather systems. You may have to keep well right at times to find the best snows. The steep drop off north to Siete Lagunas is possible in places but can only be recommended to the experienced. From the ridge 75m above Siete Lagunas, options exist to Trevelez or southwards back to the south ridge at 3000m. After heavy snows this is the only safe route until consolidation of the snow pack occurs. Easy angled throughout, it is nevertheless a long and fine outing. If heading for the Hoya del Portillo, the boring trudge from the Mirador de Trevelez south is more than made up for by the thrill of the descent through the trees at the end of the day back to the Hoya del Portillo or beyond if the snow allows. An extension of the west flank descent or useful if you have been ski touring on Loma Pelada or the Puntal de la Caldera. Head south from the Caldera hut and give the lower part of Mulhacens west face a wide berth by heading out west (see avalanche area on map). Then go where the snow is. There is normally plenty throughout the winter, and a lot of it too, as the wind blown snow off the tops tends to congregate here. Enjoy the descent down the Rio Mulhacen (buried of course) until the 2500m level, when a escape left contouring the hillside can be made. Just round the corner the welcoming Refugio de Poqueira is reached. Difficult to find the start point on first acquaintance. Not to be used in mist unless extremely confident. From the trig point at the south summit keep west of the ridgeline and drop into the shallow bowl that is actually the line of the main summer access path. Descend some 50m. To the south west, steepening snow slopes can be seen. This is in a direct line to the Poqueira hut. Take these slopes which converge and steepen. There is a levelling out as the remnants of the old road are crossed. Below and to the left are a line of small cliffs. The way direct to the Poqueria hut takes a line just to the right of these. In no time at all you will be enjoying a jug or two of vino caliente! An easier and less steep option than the above route, although care should be taken to identify the correct start point where the south ridge is left. From the south summit go east to find the best snows before contouring back south and finally south west to rejoin the main south ridge. The start is at about 3000m and takes a line down the bowl right of the south ridge. This is at the foot of a steeper section of the ridge where the slope angles ease. There is a short steeper section and then cruising skiing south west. Make note of some prominent rocks lower on the right. You will need to keep well left of these. The slope steepens and the hut can then be clearly seen. Descend where you can. If late in the season there is a narrow but reliable shallow gully always filled with skiable snow slightly to the left. This leads down to the Poqueira hut access track. Follow this right for 200m back to the hut. Ok. Not strictly Mulhacen, but worth including if the snows lie thick and deep. The ski route follows the line of the summer access track from Trevelez, and starts at the Mirador de Trevelez. Head down in an easterly direction. Can be quite testing in marginal snow conditions or mist. It is however, one of the most rewarding of the Sierra Nevada ski descents. You may well have to be quite ingenious lower down to keep linking snow. There is nothing quite like coming back down to a village at the end of a good day in the hills though. The local camposinos might well think you are a creature from another planet as you trudge your way in ski boots through the high parts of the village on your way to a well earned beer!